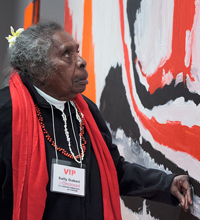 Indigenous Australian artist Mirdidingkingathi Juwarnda Sally Gabori was born around 1924 on Bentinck Island, Queensland. She was one of the Kaiadilt people and had little contact with non-Kaiadilt people until 1948 when drought, high tides and salination of underground freshwater stores caused all Bentinck people to be moved by missionaries to Mornington Island. Up until this time she had lived a traditional life gathering bush foods, fishing with traditional traps, rolling bark string and making dilly bags and coolamons. She continued her connection to her country through language, storytelling and returning whenever possible. Gabori produced traditional pandanus fibre and hibiscus bark handicrafts throughout her life but began painting on canvas when she was in her late seventies in 2005. Her use of vibrant colour to depict the landscape of her homeland soon led to her receiving national acclaim. Her work shows an intuitive mixing of colour, blending of shapes with forms in dynamic relationships and a sense that she is telling the stories of her country. Her words, “Danda ngijinda dulk, danda ngijinda malaa, danda ngad (This is my Land, this is my Sea, this is who I am)”, give us a glimpse of how she thinks about her work and the issues that made her want to paint. Her art was the only way she could share the history, ecology and stories of Bentinck Island because her language, Kayardild, is no longer spoken. From the time she started to paint Gabori was acclaimed as one of Australia’s leading contemporary painters. Her paintings are admired for their life, immediacy and intuitive use of bright colour. Her work expresses her strong attachment to her culture and large family together with the impact of the move to Mornington Island which brought about a great longing for her ancestral land. Her works are considered to be abstract and are mostly land and seascapes that show her amazing sense of colour. Not only is Gabori one of Australia’s most highly regarded contemporary artists, but she is also well known overseas. Her work has been exhibited in New Zealand, England, America, Korea, the Netherlands and Italy and is in important collections and major institutions in Australia and overseas. These include the National Gallery of Australia, National Gallery of Victoria, Queensland Art Gallery, Art Gallery of Western Australia, Auckland Art Gallery Toi o Tamaki in New Zealand, Musee du Quai Branly in France and the Museum of Contemporary Aboriginal Art in the Netherlands. She has been a finalist for many art awards and has won several of them. In 2013, Gabori’s work was part of the Australia exhibition at the Royal Academy of Arts in London. This was the first major survey of Australian art in the United Kingdom for fifty years. This was the same year that Sabori’s work was shown at the 55th Venice Biennale as part of an international art project called Personal Structures. In 2014, Sally Gabori was awarded a successful commission to be part of the new Brisbane International airport terminal upgrade. This amazing accolade is an immense tribute for the artist and her Kaiadilt family.